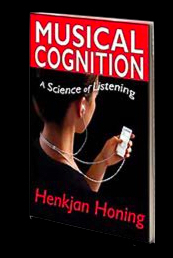 This week a plug for my new book that just came out: Musical Cognition: A Science of Listening (Read fragments of it online at Google Books; currently available with more than 30% discount on the hardcover at Amazon and Barnes & Noble). "Musical Cognition suggests that music is a game (or 'benificial play'). In music, our cognitive functions such as perception, memory, attention, and expectation are challenged; yet as listeners we often do not realize that the listener plays an active role in reaching the awareness that makes music so exhilarating, soothing, and inspiring. In reality, the author contends, listening does not happen in the outer world of audible sound but in the inner world of our minds and brains. Recent research in the areas of psychology and neuro-cognition allows Honing to be explicit in a way that many of his predecessors could not. His lucid, evocative writing style guides the reader through what is known about listening to music while avoiding jargon and technical diagrams. With clear examples, the book concentrates on underappreciated musical skills — “sense of rhythm” and “relative pitch” — skills that make us musical creatures. Research on how living creatures respond to music supports the conviction that all humans have a unique, instinctive attraction to music. Musical Cognition includes a selection of intriguing examples from recent literature exploring the role that an implicit or explicit knowledge of music plays when one listens to it. The scope of the topics discussed ranges from the ability of newborns to perceive the beat, to the unexpected musical expertise of ordinary listeners. The evidence shows that music is second nature to most human beings — biologically and socially." Why would anyone listen to sad music? See also the San Francisco Classical Voice.